Now that school has started and is in full swing for everyone, I know that many juniors and seniors (maybe even sophomores!) are starting to tour colleges. During spring break of junior year I did a major college road trip and toured several colleges all at once. I feel that after all these tours I am somewhat of an expert at knowing what to look for in a college, especially on college tours. I also am an aspiring tour guide, so hopefully by the end of freshman year I will be a tour guide at Furman! Only time will tell! This is honestly one of the most important tips in my opinion. Touring a college while classes are in session means that you are able to get a feel for the people on campus. You get a taste of their lifestyles- is the campus active or is everyone studying all the time? do people seem rushed and stressed or relaxed? could you see yourself interacting with these people on a daily basis? These are all important questions that might not seem important now, but you want to make sure you fit into the general vibe and lifestyle of the students. You don't have to be like everyone on campus, but you wouldn't want to go somewhere where you didn't like the general vibe that the students put off. You might be a bit of an overachiever to some if you do this, but who cares? To get the most out of your tours, you need to be able to hear what the tour guide has to say, see what they are pointing out, and talk to the guide if you have questions. If you are in the back with a group of 20 people, you might not see everything the tour guide points out. Standing near the front allows you to clearly hear and see the guide. This probably seems obvious, but it is really helpful to do a bit of research before touring. That way, you can get basic questions such as "does this college have my major" and "is there greek life" etc. out of the way and ask questions that pertain specifically to student life and/or you. Of course you need to ask any questions you have, but if you research the school a bit, you will be able to ask questions that might not be addressed. An example would be that I knew Furman had research for undergraduates, so I asked at what point in the undergraduate career are students most likely to partake in research. These are more detailed questions that might not be found on a website or in the spiel that tour guides and admissions counselors give. Most colleges are too big for a tour guide to take you completely around. Even Furman, a fairly small campus, wasn't able to show every building and location on campus on the tour. So, I recommend planning some time after your tour to walk around the campus with a map. Go inside buildings that might have your classes in them (check out the science building if you want to do premed, the liberal arts building if you want a major in the humanities, etc.) Check out the dining hall, fitness center, library, and other services. Most college campuses leave these doors unlocked in the day, so you are welcome to go on in. Even if you got to tour these buildings on the tour, you might want to go in more depth. Also consider walking around the campus just to get a feel for the environment and landscaping. If you think a campus is ugly, you might not want to go there for four years. College tours generally only show you the prettiest parts of campus, so delve a bit more into the campus so you can discover if you actually like how your campus looks (this isn't the most important thing, but it can become important when you are trying to narrow down your selection). One of the more influential aspects of my college decision process (and it was more influential than I thought it would be) was the mannerisms and attitudes of my tour guides. At Furman, the tour guides were very welcoming and acted as if they wanted you to be here, not the other way around. At other colleges, the tour guides seemed very pretentious about their school and acted as if some questions people asked were "below their level". At other colleges, the tour guides were so unprofessional that I left the tour early because I didn't want to give any more time to the tour. If you tour guides are upbeat, welcoming, helpful, etc., that is a good indicator that they love their school. If they seem kinda like they are just trying to get through the day, that might indicate that the workload at that school is too much for them and they aren't enjoying their experience. Of course, take this as a grain of salt because sometimes people might not seem enthusiastic but they actually love their experience. Just be mindful of this. Of course parents should be on tours and ask questions such as cost, tuition, etc., but you should be the one to ask questions pertaining to you- such as majors, Greek life, residence life, etc. You are responsible for your college experience, so you should ask these questions. Don't make your parents ask these questions because you are too shy. Pretty soon you will be in charge of all things relating to school, so you need to get used to being proactive and forward. 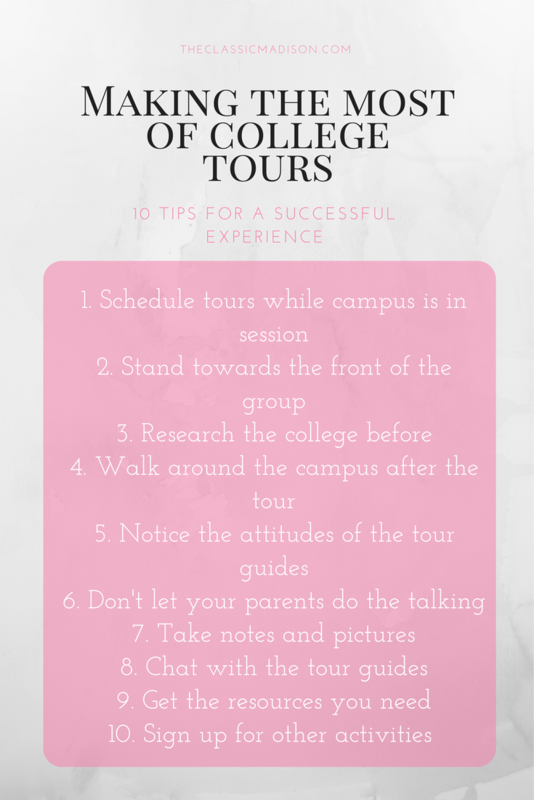 This might seem a bit much, but can honestly become so helpful after hearing multiple college tour info presentations and going on endless tours. I don't mean take notes like you would in class, but jot down a few important notes pertaining specifically to things you are interested in (such as majors, study broad, residence life, etc.) Also jot down prices and deadlines if you want to start keeping track of that. While on your tour, take pictures of important buildings and locations on campus- such as inside the library, dorm rooms, quad areas, gyms, laboratories, etc. This way you can have a visual to look at while comparing and deciding colleges (not just looking at the beautiful, and oftentimes, posed pictures on the websites). This is something that not everyone thinks about, but I made sure to take use of during tours. Whenever no one was asking questions or the tour guide wasn't talking, I would ask the tour guides what they were involved in, their favorite memory on campus, and other fun questions to get a feel for their involvement on campus. This is also a great way for you to start forming connections with current students on campus. If you are interested in a specific program on campus, be sure to get the information for it whether that be going directly to someone's office to introduce yourself or getting a pamphlet of information. You can also get a business card or two for individuals on campus who would be of assistance to you- such as the head of a department or a coach. Do this after your tour if necessary. You can just ask someone to direct you for guidance on the topic. While signing up for your tour, see if you can have lunch with a current student, meet with an advisor, stay overnight, or sit in on a class. Lots of colleges offer these supplemental activities and these can be crucial to determining where you want to go. If you cannot sign up for these, still consider eating in the dining hall or stopping a student and asking some questions. This list is by no means exhaustive, but I hope I have given you a good amount of advice to help you in this long and stressful process. College tours can be dreadful for some but exciting for others. The most important tidbit of advice I can give you is that if you find the place you want to go, you will generally feel it while on the tour. I did not feel the same way touring other colleges as I did Furman. Hopefully you will get this same feeling I did. If not, there is no need to fret, but try to figure out which college made you feel the most at home. Good luck on your college tours and application process. If you need help with the application and decision process, check out this post here.